Every person who has changed his job has faced this problem one time or the other – They have to run from pillar to post for their Provident Fund account to be transferred to their new employer. In most cases it takes nearly 30 days for the account to get transferred. But that will be history now. By August, the entire Employee Provident Fund Transfer process is set to go online across the country. Once that happens, employees will be able to transfer their accounts in 3 days flat. According to the press release by labour ministry, they have unveiled a plan that will facilitate development of system for Web based services to employers and employees for online submission of forms and settlement of claims. In 2012-13, 107.62 lakh claims were made to EPFO office for settlements, out of which 88 percent were settled in 30 days, which is currently the stipulated time according to citizen charter. However, 12 percent or approx 13 lakh claims did not get their settlements in time. To ensure that claims and settlement process is expedited, Minister of Labour & Employment unveiled a new revised transfer claim form for EPFO beneficiaries, as a first step towards online transfer claim facilities. 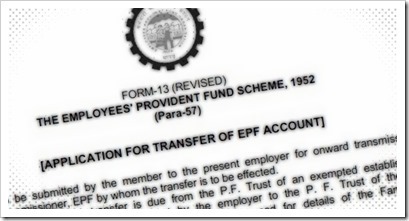 Here is how the process of EPF transfer will work online. Step 1: Employer can submit the forms online for their employees after they register and verify their digital signature with EPF Office. Step 4: EPFO verifies signatures and carries out transfer to the new employer. The employee whose account has to be transferred will be informed through SMS and e-mail about the stage of process of the claim. The entire process will take 3 days to complete end-to-end. Micromax Canvas 4: A Disappointing Phone At A Very Disappointing Price! It takes much more than 30 days for a PF transfer to happen. I am waiting for almost 2 years. That is really very good news! (if it works as claimed). I am waiting for this facility to go online.